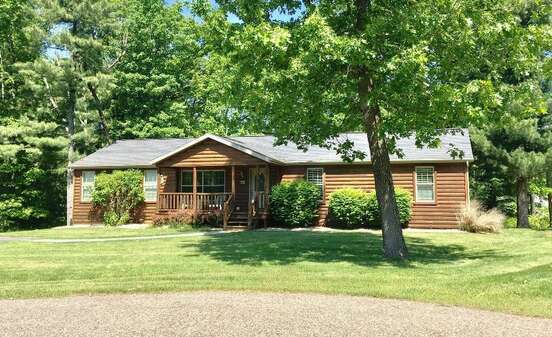 Situated on a golf front lot, this four bedroom, two bath ranch style hideaway is in an ideal location to enjoy the peace and quiet Wisconsin life has to offer. This spacious home is the perfect place to set up camp with friends and family and is only a few minutes’ drive from the excitement and activities of Wisconsin Dells. The deck has a large gas grill and a fire pit. Grab a bag of marshmallows and relax the summer nights away. 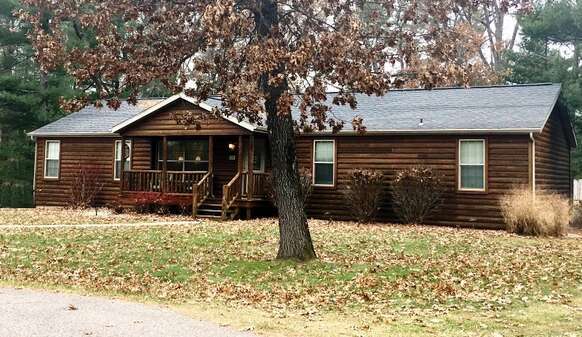 Woodlands Retreat sleeps a maximum of 8 people. The log sided four bedroom home sleeps eight people comfortably. The master bedroom has a king size bed with adjoining master bath with jacuzzi tub. Three additional bedrooms have very comfortable queen size beds. All four bedrooms have their own TV's mounted on the wall for added space in the rooms. Prepare brunch at your leisure in the full kitchen complete with modern appliances including a dishwasher. Next to the kitchen is a large utility room with a washer and dryer. The separate dining room is open to the adjacent family room which comes with a flat screen TV, a gas fireplace to keep you warm in the winter months. This home even offers an ice cream maker and old-fashioned record player. During warmer weather enjoy the huge screened in porch which allows for additional space to sit and look at the scenic beauty that is Spring Brook Golf Course. High speed internet is available. Woodlands Retreat is a short walk or even shorter drive to Spring Brook’s Clubhouse, which is home to the Spring Brook Sports Bar & Grill, indoor/outdoor pools, fitness room, golf course and pro shop. Home sleeps maximum of 8, rates based on 8 people over the age of 3. Extra guest fee of $15/night per additional guest applies. Memorial Day and New Years Eve Holidays require $250 Security Deposit.